What makes a good trail horse? Anyone who enjoys trail riding will tell you that a good trail horse is worth his weight in gold. A common misconception is that if the horse isn’t good enough for any other sport, he will be fine for the trail. This is not necessarily the case. A good trail horse is born and trained as much as any other performance horse. People riding in different terrains will most likely have different sets of criteria. I think it is very important to identify your particular needs before you go looking for a trail horse. When looking for a trail horse, age is always a factor and younger is not necessarily better. I personally prefer to buy a horse that I can get on and ride from day one. But other people like to train their mounts rather than correct someone else’s training. If I find the right young horse (one with the qualities I first mentioned), I am willing to put in a little time on him. I don’t fancy myself a trainer, but in these situations, I think there is nothing better for young horses than to be out on the trail behind a steady, experienced horse. I have a favorite trail for training young horses. It is fourteen miles round trip and offers a variety of experiences including creek crossings, a short bridge and mud. But as I said, my personal preference is to buy a trail horse that I can get on from day one. So I certainly never hesitate to buy one with a little age on it. A healthy 10- or 12-year old horse still has many good years left in him and the fun can start right away. I might have to work out some kinks, but a couple of good long rides and we are usually on the same page. Remember, though, age doesn’t necessarily equal experience. Real trail experience can be worth the extra money on the purchase price, especially if you are just starting out or if you are like me and want a better than average chance that you won’t have problems on the trail. I am just no longer interested in having a rodeo 15 miles from the trailer. I am not partial to any one breed, including a grade horse, if he has the traits I need. 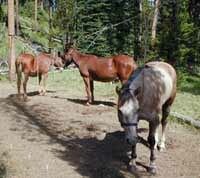 In our area of the Rocky Mountains, we see a lot of Quarter Horses, Paints, Morgans, Arabians and all manner of crosses. We also see a lot of gaited breeds like Tennessee Walkers and Missouri Fox Trotters. Additionally saddle mules are becoming quite popular. All of these will make fine trail horses/mules if, once again, they have the right traits. One note, if you like to ride with groups or you will always have the same partner, it would be wise to ensure the trail horse you are looking at doesn’t travel too much slower or faster than the group. One of our customers with a Tennessee Walker tried riding with her friends who ride Quarter Horses. By the end of the ride, both horse and rider were miserable from having to adjust his natural gait to stay with the group. I don’t like to get hung up on which are better, mares or geldings, because I think it comes down to personal preference and the individual animal. My first choice is a gelding, but I would never turn down a mare as a trail horse if she had the right qualities. I would, however, avoid a stallion for the trail. He could be the best horse on the ranch, really well behaved and always good with you. But you never know who you might meet on the trail or how well they can control their horse. Ideally when you find a horse that has the qualities that you desire and you think would make a great trail horse, you will be allowed to try him out for a week or see how he is in at least a couple of different situations. Hopefully, this will tell just what level of experience he truly has and whether all those traits you saw at the barn are still there on the trail where you really need them. And if the owners won’t let you try the horse out, it might be a bad sign. After many years and many mounts, there are two that really stick out in my mind as having been some of the best. Elmo was most likely a registered Quarter Horse, but I never knew for sure. He was steady, willing and loved people. We had four great years together before he retired with a little girl nearby. Moose, however, was NOT a people horse. But he was a terrific trail horse once you caught him. He was a good looking Paint who knew he was the leader, and so did the rest of the string. He was agile, strong and he always paid attention to where he was going and where he put his feet. I miss them both.